Touch guidelines like Apple's 44 pixel target are based too much on technology, and pixel sizes. They are not based on the real world, on people's hands, fingers and thumbs. Now we have real research, including thousands of new, original observations on how people hold and touch their phones, phablets and tablets. 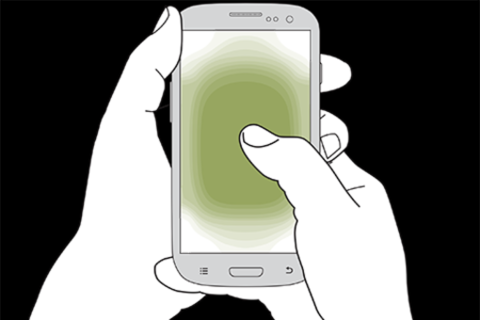 We can increasingly understand why people act this way, and can use this information to design for the different ways people actually use their mobile devices: Fingers and thumbs take up space, and cover the screen. People have worse accuracy at the corners of screens than the center. People are worse at using their touch screens just when carrying a bag of groceries in their other hand. Steven will present not just the background and principles of designing good mobile touch screen experiences, but give ten specific guidelines you can use to make sure anything you design or make for phones or tablets is readable, understandable, usable, and tappable. Steven Hoober wrote the book on mobile design patterns, and is best known for his ongoing research into how people really use touchscreen phones and tablets. He has been doing mobile and multi-channel design since 1999, designing the earliest mobile app store and the first Google mobile search for Sprint, several mobile browsers, many mobile sites such as Weather.com, and apps for companies like Hallmark, US Bank and Cummins. Steven maintains a repository of mobile design and development information including all the content from the O'Reilly book Designing Mobile Interfaces at the 4ourth Mobile Patterns Wiki, regularly writes for UX Matters magazine, and UX Magazine, among other writing and speaking.